In March 2016, the national unemployment rate was 5.0 percent, unchanged since the end of the fourth quarter in December 2015. From December 2015 to March 2016, 30 states and the District of Columbia saw their unemployment rates decline, while 14 states saw unemployment rise. While about half the states in the nation have returned to their respective pre-recession unemployment rates, conditions vary greatly across states and across racial and ethnic groups. In March, state unemployment rates ranged from a high of 6.6 percent in Alaska to a low of 2.5 percent in South Dakota. Nationally, African Americans had the highest unemployment rate in March, at 9.0 percent, followed by Latinos (5.6 percent), whites (4.3 percent), and Asians (4.0 percent). Following is an overview of racial unemployment rates and racial unemployment rate gaps by state for the first quarter of 2016. 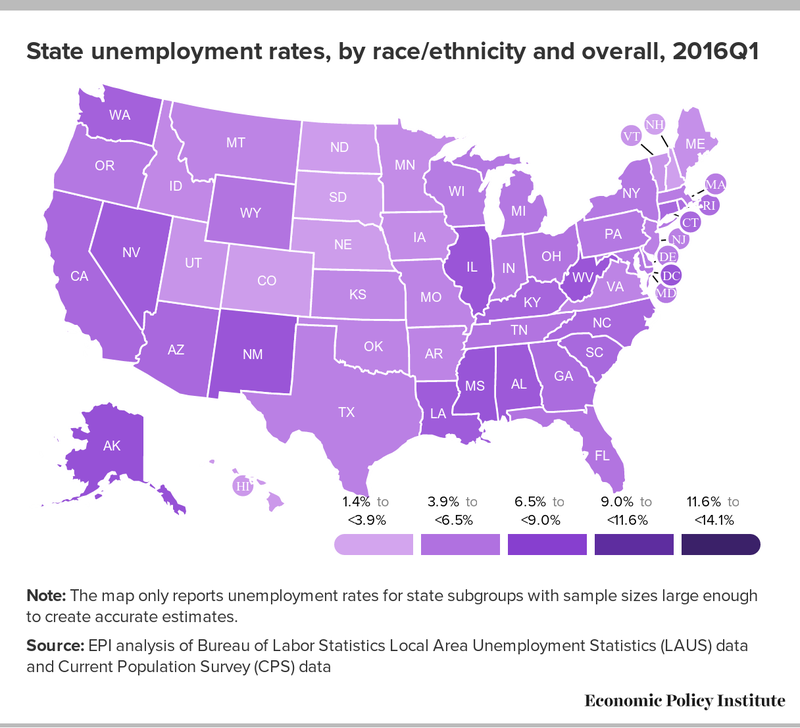 We provide this analysis on a quarterly basis in order to generate a sample size large enough to create reliable estimates of unemployment rates by race at the state level. We only report estimates for states where the sample size of these subgroups is large enough to create an accurate estimate. In the first quarter of 2016, the white unemployment rate was lowest in South Dakota (1.4 percent) and highest in West Virginia (6.6 percent), as shown in the interactive map, which presents state unemployment rates by race and ethnicity. South Dakota also had the lowest white unemployment rate in the third and fourth quarters of 2015, while West Virginia has had the highest white unemployment rate for four consecutive quarters. As shown below in Table 1, which displays changes in state unemployment rates by race and ethnicity from the fourth quarter of 2007 to the first quarter of 2016, Wyoming is the state where the white unemployment rate is most elevated above its pre-recession level—2.1 percentage points higher than in the fourth quarter of 2007. On the other hand, the white unemployment rate is at or below its pre-recession level in 24 states: Arkansas, California, Colorado, Iowa, Kansas, Maine, Maryland, Massachusetts, Michigan, Minnesota, Missouri, Nebraska, New Hampshire, New Jersey, New York, Ohio, Oregon, Pennsylvania, Rhode Island, South Dakota, Tennessee, Vermont, Washington, and Wisconsin. This is four more states than had reached this milestone in the last quarter. The white unemployment rate is within 0.5 percentage point of its pre-recession level in another 13 states. During the first quarter of 2016, the African American unemployment rate was lowest in Delaware and New Jersey (5.4 percent) and highest in Illinois (14.1 percent). Illinois was also the state with the highest black unemployment rate during the previous quarter. Since the fourth quarter of 2015, the state’s black unemployment rate has risen 1 percentage point as unemployment has increased statewide. Fifteen states had African American unemployment rates below 10 percent in the first quarter of 2016—in 11 of these states, the rate was lower than the first quarter national average for African Americans (8.8 percent). As shown below in Table 2, which displays the black–white and Hispanic–white unemployment rate ratios in the first quarter of 2016, Delaware’s black–white unemployment rate gap was the smallest in the country. In that state, the black unemployment rate was 1.3 times the white rate, down from 1.9 times the white rate during the previous quarter. This change was due entirely to a significant drop in the state’s black unemployment rate during the first quarter. African Americans are about one-fifth of the workforce in Delaware, where employment increased 0.4 percent between December 2015 and March 2016. In New Jersey, the other state with the lowest first quarter black unemployment rate, the ratio was 1.4, which is virtually unchanged from the previous quarter (1.5). The largest gaps were in the District of Columbia and Arkansas, where the black unemployment rate was 5.5 and 3.6 times the white rate, respectively. With regard to recovery, the African American unemployment rate is at or below its pre-recession level in nine states: Indiana, Michigan, Mississippi, New Jersey, New York, Ohio, South Carolina, Tennessee, and Texas. But this numerical “recovery” must be put in proper context because with the exceptions of Texas, New York, New Jersey, and Tennessee, each of these states also had black unemployment rates that were among the highest in the nation before the recession. Of the states where the black unemployment rate has recovered, only Indiana, Texas, New York, New Jersey, and Tennessee have black unemployment rates lower than the first quarter national average for blacks. The black unemployment rate is within 0.5 percentage point of its pre-recession level in Delaware and Georgia. The black unemployment rate remains most elevated above its pre-recession level in Alabama (4.5 percentage points higher). Before the recession, the African American unemployment rate in Alabama was 5.3 percent—about half of what it is now. The Hispanic unemployment rate was highest in Washington and Illinois (7.8 percent) and lowest in the District of Columbia (2.7 percent) and the states of North Carolina and Utah (4.4 percent). Since the fourth quarter of 2015, the Hispanic unemployment rate has risen in both Washington and Illinois, while North Carolina has had the lowest Hispanic unemployment rate for the last two quarters. The Hispanic unemployment rate is at or below its pre-recession level in six states: California, Colorado, Florida, Georgia, New York, and North Carolina. The Hispanic unemployment rate is within 0.5 percentage point of its pre-recession level in Nevada, Texas, and Utah. In the fourth quarter of 2007, Colorado, Florida, and Texas had Hispanic unemployment rates lower than the national average among Hispanics—a distinction they continue to hold. The Hispanic unemployment rate was most elevated above its pre-recession level in New Mexico (2.3 percentage points higher). The Hispanic unemployment rate is the same as the white rate in North Carolina, while the Hispanic–white unemployment rate gap is largest in Colorado, where the Hispanic unemployment rate is 2.3 times the white rate. This ratio is up from the previous quarter (1.7) as a result of the white unemployment rate declining faster than the Hispanic unemployment rate. The Asian unemployment rate was lowest in Hawaii and New Jersey (2.6 percent) and highest in New York (4.8 percent). Hawaii and New York were also the states with the lowest and highest Asian unemployment rates, respectively, during the fourth quarter of 2015. The Asian unemployment rate remains most elevated above pre-recession levels in New York (1.5 percentage points). The Asian unemployment rate was below the pre-recession levels in California and Illinois, and within 0.5 percentage point of the pre-recession level in Hawaii, Washington, and New Jersey.